On 4th December 2010 Planet Venus would reach “Venus Greatest Illumination Extent” in the morning skies. Because of which Planet would appear very brighter than it would be in months to come as Venus gets away from us in its orbit. People can spot Planet Venus towards East direction which would rise 3 hours before Sunrise. Venus can be spotted in morning skies until end of July 2011. What is Greatest Illumination Extent ? Greatest Illumination Extent occurs when after inferior conjunction with sun, the size of Venus’s Disk appears big and Venus although illuminated less than 27% by sunlight as seen from earth covers more square area on the sky’s dome than at a fuller or thinner phase. Hence this event provides observer’s with very bright Planet Venus in many months to come. SPOT VENUS – MORNING – Before Sunrise in the East – Before Sun rise one has to look towards East Direction. One would spot bright star like object which doesn’t twinkle compared to stars in its background i.e. Planet Venus. It can be spotted sufficiently above horizon in east from as early as 4 a.m. before sunrise. Was Venus Visible in year 2010 ? Since beginning of Year 2010 to 2nd Week of October Venus was visible in Evening skies (West Direction). After that due it journey (in its orbit) around sun it became close to sun from our view and disappeared from evening skies only to appear in morning from 4th Nov. Presently Venus visible in the morning skies and morning walkers can see Venus until end of July 2011 looking east in the morning before sunrise. 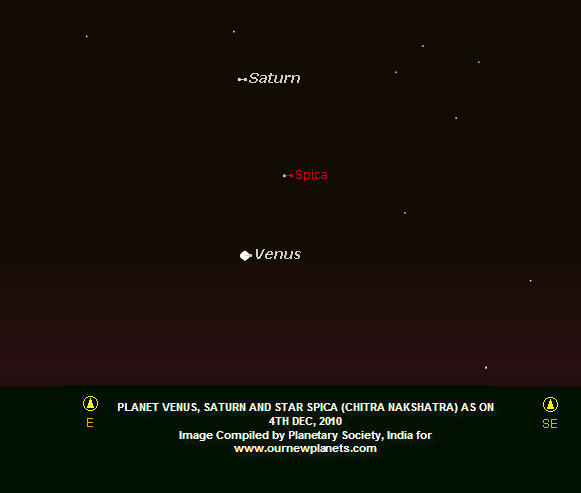 How to locate Planet Saturn and Spica (Bright star of Chitra Nakshthra) ? After locating Venus in the Eastern Skies. 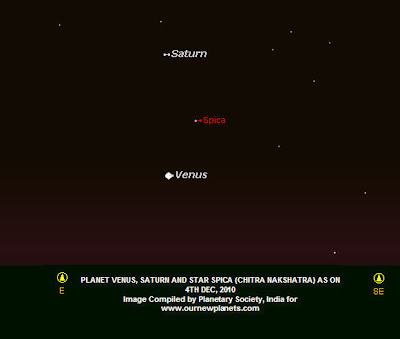 If one looks just above Venus, one can spot a small dot like non twinkling star like object which is Planet Saturn. Whereas the twinkling object which is visible between Venus and Saturn is star Spica. In India it is known as Chitra Nakshatra. Spica is now in similar in brightness compared to Saturn.